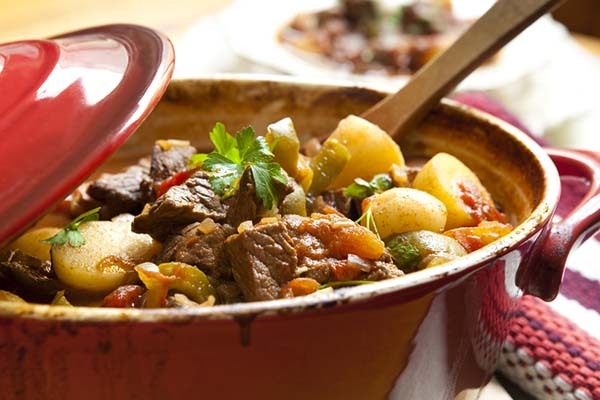 A perfectly cooked beef stew is certainly one of the most comforting and easy-to-cook dishes. It is among those dishes which can be cooked with minimum effort and are ideal for your family in the long winters. Cooking a tasty and filling beef stew is rather easy and simple. In order to learn how to cook beef stew, you need to understand that there are some necessary steps that you must follow. One of them is searing the meat properly. Another important step is taking adequate time in cooking the stew. The key to a great stew is to cook it slow and low cooking for around 2 hours. Here you will find a simple recipe for a delicious beef stew which you will be proud to serve to your family and your relatives. Cut away large chunks of fat from the outer part of the chuck roast and then cut into small cubes that can easily fit inside your mouth. First cut the meat into slices and then cut the slices into different strips. Now it will become easier for you to make cubes from the strips. Make the soup pot fairly warm and then start searing the cubes of chuck roast. Put a large pot or Dutch oven on heat (medium-high) and spray some vegetable oil so that a thin film is formed in the bottom. When the oil becomes sufficiently hot, then add in the cubes in batches. Sear the meat evenly on both sides. Make sure you do not put too many cubes in one batch. Add some salt and pepper and sprinkle them on the cubes while searing. Allow the cubes of chuck meat to get sizzled for around 4 to 5 minutes. After the bottom side of the cubes have turned dark brown and crusty and comes off from the pan easily, then you can flip them. Continue to sear the meat on all the sides. Keep the cooked meat in a separate bowl and sear the rest of the meat cubes in batches. If the cooking pan appears dry, you should add one or two teaspoons of vegetable oil before putting in a new batch. A dark glaze, also known as fond, will eventually form in the bottom of the cooking pan while you sear the cubes. The consistency of this sticky caramelized glaze will add a magical flavor to your beef stew. Cooking the vegetables is an important part in learning how to cook beef stew. Once you have seared the cubes, then start cooking the vegetables. Add a teaspoon of oil and put the heat on medium. First add onions and cook them for around 8 to10 minutes, until they become translucent and soft. Then add celery and later put garlic into the pan. After cooking for 30 seconds or so, add some salt and tomato paste. You also need to add a tablespoon of Worcestershire sauce as well. Put flour over the cooked veggies and stir the mixture until the vegetables appear mushy due to the coating. Now increase the heat to medium-high again and add wine into the pan. It will start steaming and bubbling instantly. Now scrape the dark glaze or fond that has formed in the bottom of the cooking pan. It will become dissolved due to the wine. Keep stirring and grazing the fond until the wine thickens and reduces slightly. Add back the seared meat cubes in the pan and put in the bay leaf and thyme sprigs. Then pour in the broth and stir to mix all the elements in the pan. After bringing the broth to a simmer, simply decrease the heat to low. Now cover the pan and simmer it for around 1 1/2 hours. Occasionally stir the stew while it cooks. Make sure it is kept at low simmer. Alternatively, you may also cook it in the oven and learn how to cook beef stew. Just preheat the oven to 300°F and cook for the same amount of time. Now add the carrots and the potatoes into the pan and again cook the stew for 45 to 60 minutes more. Keep the pan covered while cooking. After it is done, the potatoes will be cooked through and the meat will be adequately tender to flake apart with a fork. Add the frozen peas into the pan and stir. Now pour another tablespoon of Worcestershire sauce and some Red Wine into the stew. Make sure that you remove the bay leaf and the thyme sprigs. Taste the stew and add salt, pepper and other seasonings that you want. This is one of the best ways to find out how to cook beef stew easily. You can immediately serve the piping hot stew or keep it refrigerated for almost a week or even frozen for around 3 months. Author Bio: Lisha Rya is professional chef and a renowned restauranteur. She is also a freelance writer who contributes various articles to a number of food related websites and magazines. Lisha Rya is an expert in teaching how to cook beef stew. I make beef stew a lot, and I hop from recipe to recipe. This one looks like it has all my favorite things in it! Can’t wait to give it a try. Thanks for sharing! I love beef stew and I love cooking it, too. Question: is this recipe supposed to call for wine in two different steps? See step 7 and 9. For all of us who are cooking-challenged who need specific directions.